Author(s): Florence Hazane-Puch, Laboratoire de Biochimie Hormonale et Nutritionnelle, Département de Biochimie, Toxicologie et Pharmacologie, Institut de Biologie et de Pathologie, Centre Hospitalier Universitaire de Grenoble, Hôpital A. Michallon, CS10217, 38043 Grenoble cedex 09, France. Josiane Arnaud, Candice Trocmé, Patrice Faure, François Laporte, Pierre Champelovier. Aims: Selenium (Se) is an essential trace element for human health which also has antitumor properties. Little is known about its effects on brain tumor cells (BTC). The aim of this study was to investigate the anticancer effects of sodium selenite (SS) including histone deacetylase (HDAC) activity in three human glioblastoma (GBM) cell lines (LN229, T98G and U87). Materials & Methods: LN229, T98G and U87 GBM cell lines were treated with variable doses of SS for time varying from 24 to 72h. HDAC activity, cell proliferation, toxicity, cell death process, caspase-3 and MMP2 activities and Se absorption were evaluated. Results: SS modulated all the parameters tested in a dose- and time-dependent manner. We found that SS decreased HDAC activity, blocked cell proliferation and cell cycle at the G2 phase, triggered an apoptotic cell death process caspase-3-dependent and reduced MMP2 activities. All these effects were performed whereas SS was weakly absorbed (<2%). Conclusions: SS decreasing HDAC activity exhibited interesting antitumor properties in GBM cells which may be taken into account in the novel strategies for achieving tumor growth inhibition and cytotoxicity. Epigenetic modifications induced by SS should be evaluated in further studies. Keywords: Anticancer drug, apoptosis, HDACi, human glioblastoma cells, sodium selenite. Affiliation:Laboratoire de Biochimie Hormonale et Nutritionnelle, Département de Biochimie, Toxicologie et Pharmacologie, Institut de Biologie et de Pathologie, Centre Hospitalier Universitaire de Grenoble, Hôpital A. Michallon, CS10217, 38043 Grenoble cedex 09, France. Keywords:Anticancer drug, apoptosis, HDACi, human glioblastoma cells, sodium selenite. Abstract:Aims: Selenium (Se) is an essential trace element for human health which also has antitumor properties. Little is known about its effects on brain tumor cells (BTC). 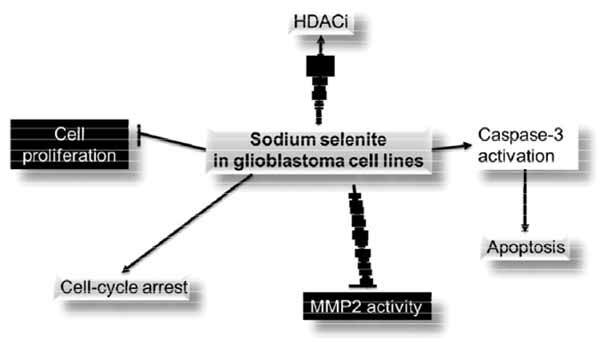 The aim of this study was to investigate the anticancer effects of sodium selenite (SS) including histone deacetylase (HDAC) activity in three human glioblastoma (GBM) cell lines (LN229, T98G and U87).